Suhel Dhanani, Director of Business Development, and Jeff DeAngelis, Managing Director, Industrial & Healthcare Business Unit, Maxim Integrated explain how best to implement an Industrial IoT (IIoT) framework. Industrial IoT (IIoT) is a reality and is being implemented across factories and process industries to enable resource optimisation, reduce unplanned down-time, and to adapt manufacturing to market needs. The question that is being asked is not whether to implement an Industrial IoT framework, but rather, how to best implement it. In essence, we are beyond the concept stage and moving towards implementing and reaping the benefits of the Industrial IoT. A case in point is the study done by IHS (published earlier in 2018) on the Siemens Digital Factory in Amberg to produce the SIMATIC programmable logic controller (PLC). To maximise operational efficiency and throughput, Siemens has automated all aspects of this manufacturing plant. In fact, per the IHS case study, the plant is so highly automated that ‘… products controlled their own manufacturing processes using a unique barcode to communicate and share requirements with production robots. An individual PLC could then take corrective action to avoid damage in the production process, and automatically replenish components in order to meet delivery deadlines.’ Machines handle 75% of the value chain on their own. An automated plant generates a lot of data that is the lifeblood of the analysis done to improve efficiency and productivity. 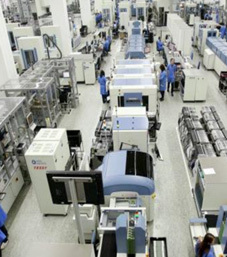 This Siemens plant generates 15-17 million data points each day at the facility – including information such as temperature profiles, speed of reflow, solder pace, solder quantity, and supplier component data. This level of automation and big data analysis has had a tremendous impact on reducing defects and on improving quality. There are numerous case studies like this. It’s time to understand that we are in the implementation phase of Industrial IoT and move the discussion towards architecting the factory’s hardware around this. The modern factory network can be visualised like a pyramid with a range of edge devices that collect information and run the production machines. Above these sit the control layer which is increasingly distributed across the plant. Of course, at the very top we have the management layer where intelligent algorithms are working on optimising machine throughput, predicting potential failures, and enabling an adaptive manufacturing flow. This can be in a private or public cloud, though we find that many plants and factories are more comfortable with the concept of storing their data on internal servers. Of course, this can change over time. Sensors are getting smarter and communicating a richer data set to the cloud. First-level analysis of vibration data is being performed at the machine level. Multiple temperature points are collected and correlated before the data is sent to the controller. Actuators have the intelligence to change a machine’s performance and characteristics. This new network structure means more capability and intelligence at the ‘edge’ of the factory network. These new sets of edge-device architectures demand high performance within a very small form factor (to fit within an existing piece of factory equipment) and with rugged design characteristics that can stand the rigours of a manufacturing environment. We will discuss how this changing edge architecture affects the design of various systems. At the base of any IIoT implementation sits a multitude of sensors that are collecting the data, pre-processing it, and sending it off to the IO hubs and/or distributed controllers. What we sometimes don’t see are how these ubiquitous sensors have shrunk in size and yet increased in capability over the years. Consider the ubiquitous safety light curtain - these are optoelectronic devices that are used to safeguard personnel in the vicinity of moving machinery that have the potential to cause harm, such as presses, winders, and palletisers. Safety light curtains can be used as an alternative to mechanical barriers and other forms of traditional machine guarding. By reducing the need for physical guards and barriers, safety light curtains can increase the maintainability of the equipment they are guarding. Figure 3 shows how light curtains have evolved using an example from SICK AG. These used to be fairly large systems back in the 1960s. Now, even more functionality is packed into a smaller form factor, giving us intelligent light curtains that can detect precisely which light beams are broken. As the form-factor shrinks, we can deploy this in various mini sub-assemblies - and use the information of the exact location of a light curtain breach to optimise the sub-assembly design. As sensors get more intelligent and connected using newer protocols that allow them to send intelligent data back, we see that their architecture is enabled by different semiconductor technologies. As Figure 4 shows, sensors are increasingly powered by microprocessors, they incorporate sophisticated serial transceivers, and they need complex power subsystems. As factories and manufacturing plants greatly increase the data that is collected, the controllers (PLCs) that process this data are getting smaller and increasing in channel density. It is not uncommon to find the number of IO channels going from 8 in a single digital input module to 32. We also see the rise of smaller and smaller PLCs (called micro-PLCs, compact PLCs, nano PLCs, etc). As controllers get increasingly distributed on the factory floor, they must shrink to be able to fit on a sub-assembly line or, in some cases, even on a complex machine. These small sizes and higher channel counts are achieved by using smaller and more integrated components that offer both reliability and smaller size. See Figure 5. Let’s take one specific example of how this shrinking size is enabled by leading-edge semiconductor technology. A typical system has many power subsystems and, since modern microprocessors/DSPs demand multiple, well-regulated power rails, the number and complexity of power subsystems is on the rise. Figure 6 illustrates how progressive integration has reduced the size of the power subsystem. The original power subsystems were discrete with a great many components outside the controller chip. As FETs and compensation elements got integrated, the size of the power solution halved. And then along came power modules which even integrated the magnetics, halving the size of the power solution again. The latest generation of power modules feature innovative packaging technology that allows an even more dramatic reduction in size for a sub-set of load currents. The industrial automation industry remains committed to addressing the key elements of industrial convergence by creating next-generation Industrial IoT solutions that increase productivity, provide adaptive manufacturing, and deliver machine level heath and status information to make mission critical, real time decisions. This commitment to enabling industrial convergence is the inspiration behind Maxim Integrated’s first micro-PLC demonstration platform in 2014. Integrated delivered a second generation Industrial IoT platform called the Pocket IO PLC demonstration platform to demonstrate the concept of adaptive manufacturing, providing another 2.5x reduction in size to achieve a 10-cubic-inch footprint along with an additional 30% in power savings. This innovation provided a powerful second step in the journey towards industrial convergence by leveraging the company’s IO-Link technology to enable re-configuration of sensors on-the-fly. As we close out 2018, the focus remains on demonstrating another element of industrial convergence that requires improving the availability, quality, and amount of real-time data that can be collected and uploaded to the cloud. Meet the ever-changing system demands of an industrial automation factory. Provide active monitoring and communication of the health and status of equipment on the factory floor. Enable factories to operate with a higher level of intelligence and finesse by allowing production equipment to be dynamically optimised or to adapt to new task assignments on the fly. An example of this level of performance density, flexibility, control, and intelligence is embodied in a new IIoT reference design called Go-IO. Go-IO consists of advanced analogue IO, digital IO, IO-Link, communications, and power solutions, providing 17 configurable IOs in less than one cubic inch. In conclusion, we are at a stage in the IIoT revolution where we need to be looking at implementation challenges of the network within a manufacturing plant. The benefits of IIoT are not in question and implementing such a network is simply a matter of being competitive. Looking at the implementation from a hardware perspective, we’re convinced that the way forward is to rethink the system architecture using the latest integrated components, focusing on the small form-factor, ruggedness, and the lowest heat dissipation.